Using dogs to chase gulls from Great Lakes beaches can improve water quality, according to a recent study. A Central Michigan University study used dogs to reduce bird feces on beaches. The waste of gulls introduces high levels of E. coli bacteria into sand and beach water, according to a recent research article in the Oxford University Press. E. coli can contain pathogens such as avian influenza and salmonella, microbiologist Elizabeth Alm and mammologist Thomas Gehring said in the study. The dogs’ harassment reduced the number of gulls by 56 percent to 76 percent. “I was pleasantly surprised that we actually saw a (strong reduction of) gulls and (improved) water quality,” said Gehring, a wildlife ecology professor at Central Michigan University. Gehring’s previous work using dogs to reduce conflicts between wild animals and people gave him the idea of using border collies to chase the birds, said Alm, a biologist at the same university. For 38 days, they conducted two trials where collies controlled gulls on two beaches while the other two were uncontrolled, Alm said. They counted how many gulls were on beaches every 15 minutes. After the 38 days, they removed the dogs for 10 days. Then they alternated this process for the second trial. The previously uncontrolled beaches were now controlled by dogs. In 2012, dogs controlled beaches seven days a week from dusk until dawn, Alm said. She and Gehring noticed birds arriving after sunrise and returning before sunset. The next year, they had dogs control beaches only at peak arrival times to harass them in larger abundance, Alm said. Dogs making eye contact with gulls scares them away, Taylor said. The act of staring down gulls and slowly creeping toward them will make them feel like they’re about to be hunted. “Over time, if (dogs) are there every single day chasing them, (gulls will) think, ‘obviously there’s a predator here every single day, maybe we should go find somewhere else to be,’” Taylor said. The Milwaukee County Parks Department in Wisconsin has experienced better water quality due to collies controlling gulls for 30 hours each week, according to an article on TMJ4 Milwaukee. 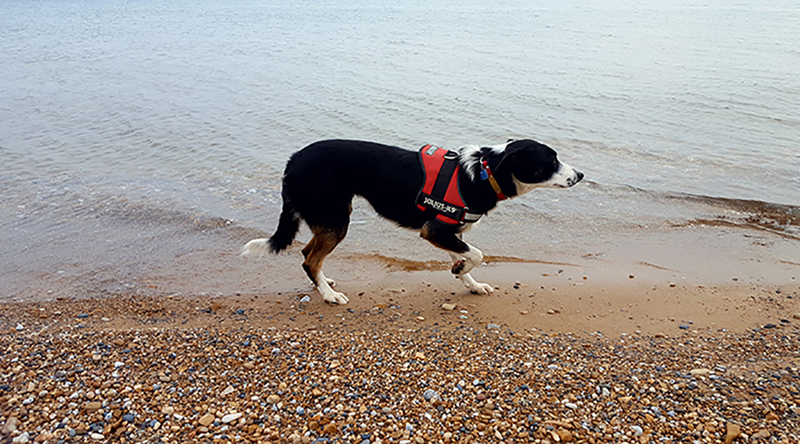 Collies are a good management option because of their effectiveness at keeping gulls off beaches, Alm said. They are a non-lethal way to reduce gull waste. The birds don’t get used to them or ignore them like they do to other deterrents. “Border collies are arguably more attractive than, for example, wires.” Alm said. So at the risk of asking an obvious question: What's to keep the gulls from moving down the lake shore to an area that is not patrolled by dogs? ...And does anyone clean up the dog poop? The handler/owner of the dog would clean up their poop...the gulls wouldn't be such an issue if people would clean up their waste. That should be fine, the only reason people should do this is because the birds are congregating at a beach that people use - and even that sounds like a very questionable practice. My advice is if people don't like birds, don't go to the beach at all. If gulls, geese and cormorants, were not protected species, plenty of people would be willing to reduce their numbers. And they would be eliminated, not just pooping somewhere else. So the Herring Gulls are a naturally occurring native species to the great lakes which has been seeing a signifcant population decline that we harrass because don't like them and want to build our summer homes on the lake shore. Where are the Defenders of Wildlife, the Siera Club, National Wildlife Fed and Audabon Soc.? How can they stand for this? Once again these faux environmentalists are very selective in their concerns. In the third paragraph, the author writes: "E. coli can contain pathogens such as avian influenza and salmonella"
E. Coli IS a pathogen, it doesn't contain other pathogens. So instead we have to watch for fog crap, barking and crotch sniffing. Great way to at least keep the beaches cleaner from serious bacteria. As a responsible dog owner who always cleans up their waste on a daily basis in my own yard, I wouldn't dream of not cleaning up my dog's waste in a public place - especially a beach. I have two water dogs, who basically aren't allowed on any beach in Michigan. All they want to do is swim and run. Born and raised in our great state, I am offended that I can't take my dogs to a beach in Michigan. I'm sure I'm not alone. So many people have dogs - and still can't take them to the water! Sherry, check out the dog beach in Muskegon. It is just south of the Pere Marquette Beach on Lake Michigan, and is a very large swath of beach where dogs are welcome! Thanks to the City of Muskegon, this is the best dog beach I have found anywhere in the US. I think dogs should be allowed on beaches, with owners being responsible for cleanup of their own dogs waste. Compliance with poop pickup is greatly enhanced with the doggie bag stations. Kirk Park in Ottawa county too! Last summer we had beach closures at Mona Lake Park and Hoffmaster Park believed to have been caused by feces from Canada Geese. There are lots of ways to scare them away; string stretched on stakes, tinsel, pinwheels, acoustic alarms, people with paint ball guns... But the birds adapt and the tactics need to change frequently. Trained dogs with trained dog handlers has to be a very expensive approach. You don't trade bird feces for dog feces? What about all the fish poop in the water. Maybe we should chase all the fish out of the great lakes while we are at it. My experience at the Mackinaw Straits is that geese are more problematic on shore than gulls. Had an Aussie shepard/golden retriever mix (Hobie) who chased away the geese, then ate and/or rolled in their poop. I did clean up after "Hobie" but still somewhat puzzled (and disgusted?) by this whole "balance of nature" thing?